Tag line: "Some doors, once opened, can never be closed again"
Most phobias and fears that we humans suffer from can be traced back to the exact same thing: we are afraid to die. 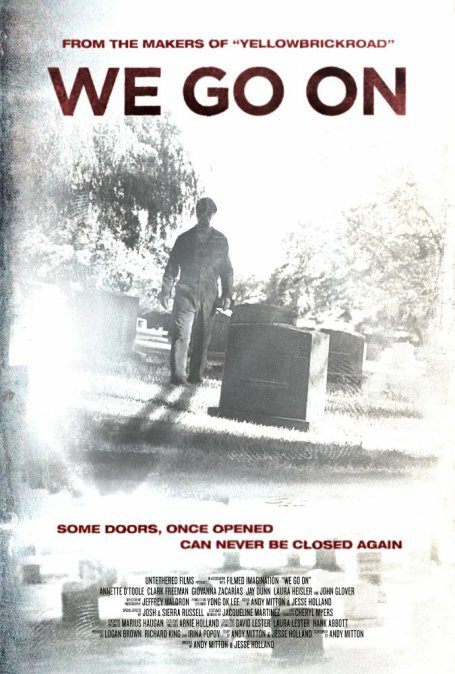 And in We Go On, a 2016 horror / thriller co-directed by Jesse Holland and Andy Mitton, we meet a man so consumed by the thought of his own mortality that he's willing to pay top dollar to anyone who can prove there is, in fact, life after death. Miles (Clark Freeman) is afraid of many things: cars, airplanes, trains, and, most of all, dying. In the hopes of proving that death is not really the end, Miles places a classified ad offering a reward of $30,000 to the first person who can convince him, beyond a shadow of a doubt, that the afterlife is, indeed, real. After reading through dozens of replies, Miles, joined by his skeptical mother Charlotte (Annette O’Toole), visits the select few he believes have the best chance of proving there’s more to life than what we experience while we’re alive. But it isn’t until he hooks up with Nelson (Jay Dunn), a Los Angeles-based janitor, that Miles finds the answers he’s looking for. Instead of giving him peace of mind, however, this revelation only manages to make Miles’ life more complex, and a lot more frightening, than it was before. Despite being a small, independently-produced film, We Go On tackles some big issues, the loftiest of which is the question of whether or not life continues after death. It is a query that the lead character, Miles, is desperate to answer, and in the first half of the movie he meets with a variety of people who claim they can give him what he wants, including Dr. Ellison (John Glover), whose approach is very scientific; and Josephina (Giovanna Zacarías), a clairvoyant who (if she is to be believed) is hounded by spirits night and day, some of which ask her to do terrible things. Along with being quite fascinating, these early sequences are also unnerving (even those that Miles’ cynical mother, played so well by Annette O’Toole, exposes as frauds will, for a while anyway, have you on the edge of your seat). Then, once Nelson the janitor enters the picture, We Go On becomes more of a straightforward horror film, and because we’re so wrapped up in Miles’ quest, we suffer the terrors he experiences right along with him. Though he does a fine job throughout the entire movie, Clark Freeman is especially strong in the movie’s second half, when the one fear his character didn’t have when he started this journey of discovery, i.e. - a fear of ghosts, becomes the only thing keeping him up at night. We Go On isn’t perfect; a scene in which Miles, who had never been behind the wheel of a car before, teaches himself to drive is definitely far-fetched, and we’re not quite sure how Nelson managed to get in touch with Miles in the first place. These (admittedly minor) quibbles aside, however, We Go On is a horror film that dares to ask some big questions while also delivering a fair share of supernatural thrills, making it, for me, one of the year’s most pleasant surprises.